The standard and light weight rifles can be built on any available actions. The barrels on the ultra-light rifles are made by Oregunsmithing, LLC and are cut rifled. This ensures accuracy even in the light weight tapers. Recommended barrel lengths are 22 inches, but have been manufactured up to 27 inches. The following receivers have been used in the manufacture of this rifle: Remington 7, 700, 721 and 722. Metal is removed from all non-vital areas of the receivers to produce an extremely light, yet strong and functional receiver. The stocks are also manufactured by Oregunsmithing. They are constructed exclusively of kevlar carbon fiber cloth and special resins with steel reinforcing pins and aluminum backers for the swivel studs. The recoil pad is integrated into the construction of the stock. The finished stocks with recoil pad weigh less than 1 pound. Custom Remington 700 SS in a Varsport stock. 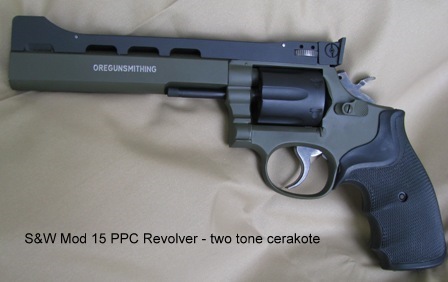 We have built heavy barreled competition revolvers for shooters throughout the United States. The actions are fully tuned. We have a large stock of old model Smith & Wesson parts to replace and repair worn out revolvers. This rifle features a modified Montana Rifle Company PH action. 28" Benchmark Barrel with 3 deep flutes and a 2" muzzle brake, for an overall barrel length of 30". Chambered in .375 CheyTac cartridge. Custom bedded and freefloated into our T-11 fully adjustable stock. Stock color is Oregon Brown with black and tan web. All metal parts are cerakoted in Coyote Tan. A Leupold Stevens VX-6 4-24 Scope mounted with an Oregunsmithing LLC Picatinny Rail. Overall weight of this rifle (including scope) is 15 lbs (not including ammo). Price of this rifle without scope is $4,500.00, plus shipping. We also offer a "Hunt - Tac Rifles" weighing in at 8 and 10 lbs.